In the hands of an experienced archer, the English longbow was a formidable weapon. Realizing its potential, the English army soon enlisted bowmen within its ranks. A longbow could be over six feet in length, which usually made it longer than the individual who was carrying it was tall. It was constructed from yew, an evergreen tree indigenous to Great Britain. The draw weight of the bow was anywhere from 80 to 160 pounds, and it had a range of 300 yards. If the archer used a heavier arrow that could penetrate armor or chain mail, the range was naturally less. Archers usually carried two quivers, or sheaths, each holding 24 arrows. The arrowheads were forged from iron and were approximately two inches long. The longbowman would bring a wide assortment of arrows into battle with him that he would use depending on the situation. Both weather and distance played important roles in his selection of the appropriate arrow. If the archer depleted his ammunition and did not have time to replenish his supply, he would have to go into battle as a foot soldier. If seized by opposing forces, archers would have their thumbs and several fingers on their right hands removed in immediate retribution. Their days as a bowman would be finished forever. Because of the importance on having an ample supply of experienced bowmen to fill the ranks of the army, a law was enacted in England requiring all men making 100 pence a year to have a bow. Every village and hamlet in the country was told to reserve an area where the villagers could practice their archery. Youngsters were taught from an early age how to handle the weapon. When a bowman could strike down a squirrel at 100 paces, he was judged proficient enough to enlist in the army. The best bowmen were bred along the Scottish and Welsh borders, where wars, skirmishes, and raids were commonplace. The ruling parties in these regions maintained household troops, and many archers were paid by the government to keep a watchful eye on their adversaries. 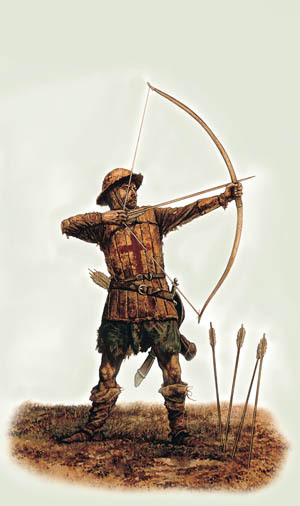 Since the long-ago day that William De Braose was struck first by an arrow, English forces utilized the longbow in numerous battles. At Crecy in 1346, Poitiers in 1356, and Agincourt in 1415, the effectiveness of the English archers won the day. Tags Agincourt, Battle of Crécy, Battle of Poitiers, Battle of Shrewsbury, Longbow, William De Braose.